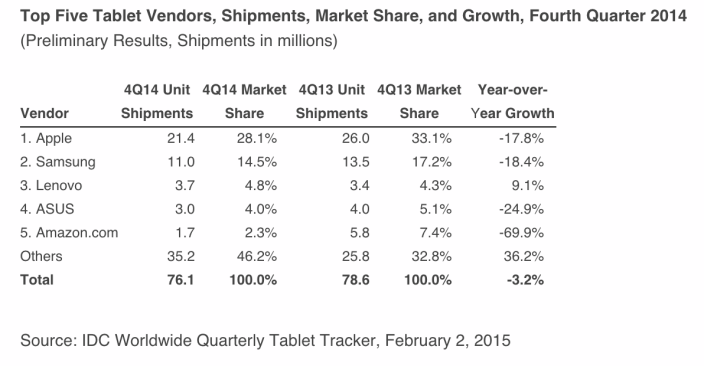 Although Apple’s tablet sales become weaker and weaker with every new quarter, the company currently remains top tablet vendor in the world. According to the latest figures from a research firm called IDC, in the last quarter of 2014, Apple sold 21.4 million iPads and got the market share of 28.1%. Closest rivals are traditionally Samsung and Lenovo with 11.0 and 3.7 million devices sold over the last three months and market shares of 14.5% and 4.8% respectively. Apple sold 21.4 million iPads during the holiday quarter last year, which gave the company around 28% market share compared to 33% with 26 million units sold during the same quarter last year. Apple beats out number two Samsung, according to IDC, which grabbed 14.5% of the market in Q4 with 11 million units shipped. 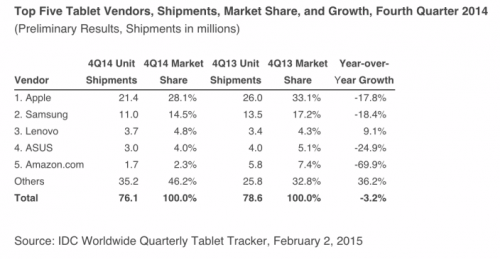 As to the other vendors, which stand in the Top 5 rating, they are ASUS and Amazon.com with 3.0 and 1.7 million units shipped in the fourth quarter of 2014 and market shares of 4.0% and 2.3% respectively. The market share of other vendors also grew last quarter from 25.8 million units and 32.8% share to enormous 35.2 million units and 46% of the market. This is mostly because of the cheap Android devices manufactured by unknown Asian firms.